Fancy Owning A Lamborghini Huracan Inspired By The Italian Air Force? Only 250 examples were made, but two have been spotted for sale in London. Remember the limited Aston Martin Vanquish S inspired by the legendary Red Arrows aerobatic team? Well, if you’re looking for another aircraft-inspired supercar to complement it, we’ve found the perfect match: how about a Lamborghini Huracan inspired by the Italian Air Force? Called the Huracan Avio, the limited-edition supercar was originally released last year, with only 250 existing examples. And now not one, but two have been spotted for sale at a couple of London-based dealerships. Presented in Blu Grifo, the first example listed for sale via Opulent Automotive features twin offset yellow racing stripes along with yellow aero accents and brake calipers. The yellow theme continues inside, with a black leather interior featuring, you guessed it, yellow stitching. It also comes equipped with a host of optional extras, including 20-inch Giano rims, Magnetorheological suspension, lifting system, transparent engine hood, navigation system, bluetooth, and fully electric and heated seats. Opulent Automotive lists the limited Lambo with only 734 miles on clock – it can be yours for £194,000 (around $244,000). That’s around the same as a brand new Huracan, but limited editions are more likely to retain their value in the future so it seems like a worthy investment. Alternatively, if the Blu Grifo color scheme (each available color is named after the coats of arms from the Italian Air Force Academy) isn’t to your taste, London dealer H.R. Owen also has a model listed for sale in a “Verde Turbine” green and black scheme for a similar price but with 5,800 miles. Under the hood, you get the same naturally-aspirated 5.2-liter V10 that powers the standard Huracan, which is no bad thing. 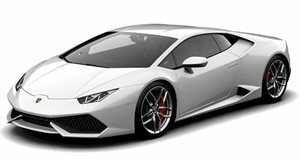 0-62 mph takes just 3.2 seconds, and the Huracan Avio will go on to reach a top speed of 202 mph.